The word "freedom" evokes all kinds of imagery: running through a wide expanse of untouched nature, setting off on one's own to explore parts unknown, standing up for deeply held beliefs – at the core, each of these manifests what it means to be free. It's fitting, too, that the word made its way into the title of Town Mountain's new album, New Freedom Blues. 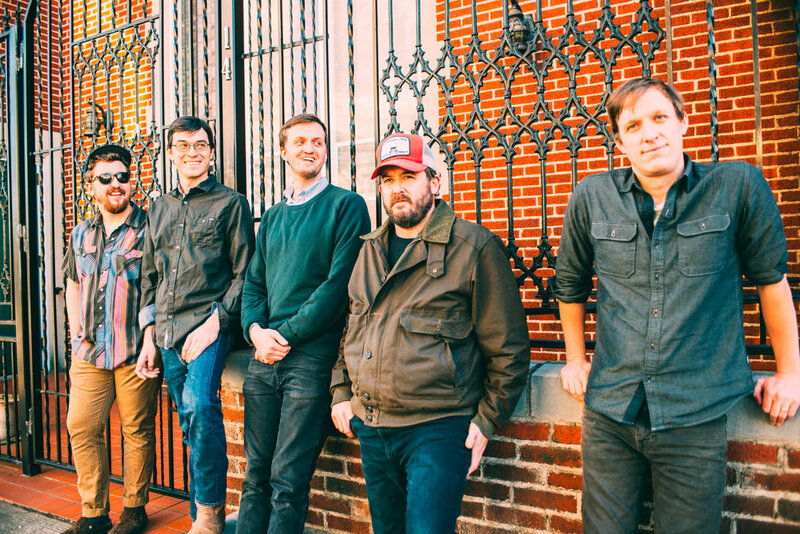 As the Asheville quintet's sixth studio album and the follow-up to 2016's Southern Crescent, New Freedom Blues marks an exciting new chapter for the band – one in which they fearlessly consider what it means to make bluegrass-influenced music in the modern era and one that should be a welcome listen for fans who have come to love the band's raucous, no-holds-barred live performances. "The album is somewhat of a departure from the sound that we’ve typically recorded, our 'bluegrass' sound," banjo player Jesse Langlais explains. "We took the songs at their face value in the studio this time, as opposed to trying to take a song and make it fit inside certain bluegrass parameters. It morphed into this idea that we should be playing the songs for what they are as opposed to what we thought they should be." Recorded at Asheville's Echo Mountain Studios with producer Caleb Klauder, the 11 tracks that comprise New Freedom Blues span the sum total of the band's eclectic influences, from traditional bluegrass to roots pop to hardscrabble honky tonk. Set for release October 26, 2018, the album marks the first time the band brought a drummer – Sturgill Simpson collaborator Miles Miller – into the studio. "Having a full drum kit on the record gave the songs a bigger sound," mandolin player and vocalist Phil Barker says. "Miles has a great musical sense, a deep pocket, and rhythmically, a strong foundation. With him and Zach [Smith] playing together, it was a solid wall of sound for all of us to ride on. He’s really intuitive about what a song needs, when to give it space, and when to make it rock a little harder." The album opens with the title track, a hard-driving roots rocker about the bittersweet feeling that comes after making the difficult decision to end a relationship. Anchored by a propulsive beat from Miller and featuring virtuosic displays of musicianship from the players themselves, the track seamlessly bridges the gap between the band's old-school influences and their progressive, genre-bending inclinations. "'New Freedom Blues' is about the feeling you get after you've broken up with someone or done something you thought would be best in the long run," Barker explains. "You keep telling yourself it was the right thing to do, but the second-guessing hurts like hell. The song specifically talks about a relationship, but the feeling could be applied to any life decisions, political or otherwise." The tune and the album title also cleverly nod to the band's sonic evolution, as well as their willingness to speak up about issues of inequality in the age of Trump. Album highlight "Life and Debt," with lyrics like, "Piles and piles and miles of cash / couldn't get me back to where I once was at," is an unflinching look at the difficult financial realities faced by most Americans. "Lyrically," I'm trying to convey the struggle that most of us have with some form of debt," Langlais says of "Life and Debt”. "Looking back to my first year of college, I recall credit card companies setting up shop in the student union, essentially handing out lines of credit to children with zero money management skills. It's predatory behavior in my opinion, but I'm trying to get that across in a lighthearted way. However, it is a very serious matter. The line, 'all the money's in the politicians' hands' is a jab at our current political climate. As long as those folks up on Capital Hill continue to keep their pockets greased, this will be an issue." In crafting the new album, Town Mountain also called upon friend and fellow musician Tyler Childers, who co-wrote the track "Down Low" with Langlais, the album's closing cut and an aching take on, as Langlais puts it, "one's buzz being too big." "To me 'Down Low' has a Waylon vibe, which is a damn good vibe to have," Langlais says. "My favorite line in the song, which was a Tyler line, is, 'I've been getting into meanness on the dark end of the street.' Ahh, that's downright lonesome." Town Mountain is Langlais, Barker, vocalist/guitarist Robert Greer, fiddle player Bobby Britt, and bassist Zach Smith. Since releasing their debut album Original Bluegrass and Roots Country in 2007, Town Mountain have made a name for themselves in bluegrass and roots circuits and have amassed a sizable catalog of original songs. They've toured with a who's who of like-minded artists, including Ralph Stanley and His Clinch Mountain Boys, the Del McCoury Band, Greensky Bluegrass, Yonder Mountain String Band, and many others. Southern Crescent debuted at number four on Billboard's Bluegrass Chart, and held strong in the Americana Music Association's Radio Chart Top Forty for 10 weeks. In 2016, Town Mountain made their Grand Ole Opry debut, performing both at the Opry House and at the famed Ryman Auditorium.